It has to happen sometime: The uneasy stand-off. Summer’s on the way — dog park here you come! 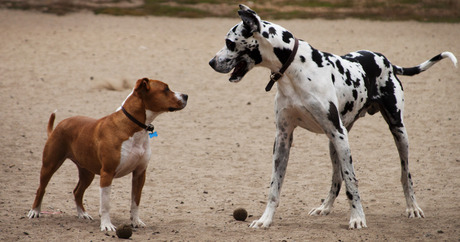 And here comes Dear Labby with advice for all your dog park quandaries… for those who missed it, take a look at Dear Labby’s Dog Park Etiquette:Part 1. This isn’t jr. high school and you’re not the hall monitor. If the dog isn’t antagonizing you or your pup, let it go. It’s your responsibility to follow the rules, not enforce them. If the dog is truly a menace, a friendly, “FYI, I’ve seen people get tickets for unleashed dogs here…” should do the trick. What should you do? Move out of his way! And if there’s not time for that, bend your knees and brace for impact. After all, this is what the dog park was meant to be: A place where dogs who’ve been cooped up the house all day can run wild, wrestle, chase each other, and just generally get their yayas out. Unless the dog is dangerously out of control, let him have his day. Ah, the dog who “loves” too much. Though the behavior is neither uncommon nor unnatural, humpers often become the pariahs of the park. If your dog’s a humper, get this under control (with help from a trainer, if necessary), sooner rather than later — or you’ll find humans and canines alike heading for the hills at first glimpse of either one of you. Catch Romeo in the act? Call him to you as quickly as possible. If that fails to abort mission, lead him by the collar away from whomever he’s set his sights on. The flip side: You’re the humpee or the humpee’s owner. This is pretty much carte blanche to do what it takes to extricate dog from victim. Don’t get me wrong — I’m not advocating using even an iota more brute strength than is required, but running interference between the dogs or physically removing the dog from your leg is perfectly acceptable. Yep, I know the one: The Chihuhuahua who thinks she’s a mountain lion. (Inevitable she stalks the Great Dane who thinks he’s a canary.) Assuming it’s highly unlikely that anyone will be harmed during this display, let the dogs work it out (usually they do, quite gracefully). It might not be fair — little dogs always get away with more — but that’s life in the big city. Most of the time, this is not worth getting the owners involved. Exception: when one dog is ganged up on, no matter the size, a human needs to intervene.